10.) The Awkward Coachman – In the scene where Mr. Bennet returns from London to be met by his daughters with a letter from Uncle Gardiner in hand, the coachman sets the brake after Mr. Bennet is out of the carriage. At this point he should have driven off. Instead, he just sits there, gawking at first, but then focusing forward, parked at the end of the pathway for no apparent reason as the Bennets return to the house. We must give some kudos to the actor who milked an extra minute or so of screen-time out of his minor role. Why is the coachman hanging around? 9.) 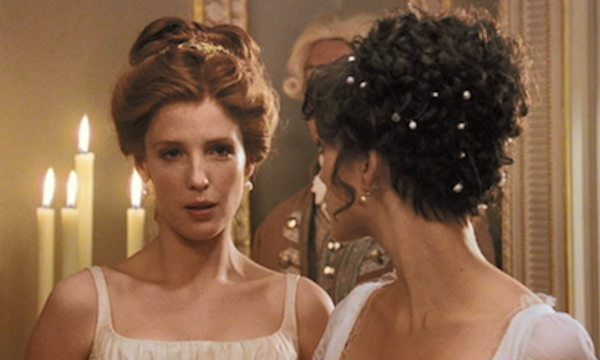 Mr. Collins’ Photobomb – I thought this scene was a little strange when I noticed, sometime around my third viewing that Mr. Collins seems to be eavesdropping in the hall while Mrs. Bennet begs her husband to intercede with Elizabeth. It wasn’t until I listened to the commentary on the DVD that I learned it was actually a goof – he wasn’t supposed to be there at all. How very Mr. Collins of him! Mr. Collins always shows up at the most inconvenient moments. 8.) Caroline Bingley’s Sleeveless Dress – There were numerous fashion faux pas in the film, but no others quite startling as this one. While women in modern times may think nothing of a sleeveless dress on a formal occasion, a gown with no sleeves would have been scandalous in this era. In their effort to contemporize the film for modern audiences, the costumers time traveled Caroline a little too far into the future. Did Caroline get her gown from France? 7.) The Rope Swing – It’s possible that no-one on the crew thought this one through, but the rope in this scene is made of synthetic fibers not available in the era, reportedly nylon. Ropes at that time were made from natural fibers such as hemp, cotton, or sisal. Perhaps they thought that no one would notice with Kiera Knightley’s pretty face center screen. Who would even look at the rope? 6.) The Boat to Nowhere – There is a sweet little montage we see while Elizabeth is spinning in that swing, that I’ve never quite figured out what it’s about. At first, it seemed to be the passing of the seasons, but after repeated viewings, I think it’s meant to be her reminiscing … or something. I still can’t make sense of the boat in the middle of the courtyard. The presence of the sailboat is obviously intentional, and probably symbolic, but it’s jarring and makes no sense in context. I can’t help but consider it a goof. What is the meaning of the sailboat? How did it get there? Where did it go? 5.) The Mystic Sun – In the opening sequence, we see Elizabeth approaching Longbourn at the back of the house. The highlights and shadows make it clear that the sun is behind her. She walks through the house and gets to the front door, where we see the rising sun shining through the trees toward the front of the house, so she is facing the sun now. The flow of the rest of the scene is clearly lit with the morning sun coming through windows on the front of the house. I thought this was an oversight, but when listening to the commentary, discovered that this goof was actually intentional on the part of the director, Joe Wright. From a cinematic perspective, it’s quite a gorgeous and magical effect, but for repeat viewers, it’s frustrating. My apologies to those who never noticed this before. Once you notice it, you can’t go back. 4.) The Case of the Immaculate Bare Feet – Does Elizabeth Bennet have some sort of super power allowing her to wade through a muddy yard in her bare feet and emerge with perfectly clean feet? If so, she probably should have used the same trick when she walked to Netherfield and got six inches deep in mud. 3.) Lady Catherine’s Magic Candle – When we first see these five candles, they are all straight, then we see the second one on the left leaning, but the next time we see them, they are straight again. We all know that the scenes are patched together from multiple takes, but I notice this every time I watch this scene. This goof should have remained on the cutting room floor. The leaning candle – can Lady C perform telekinesis? 2.) Busted – We would never have noticed this goof had the camera not panned around the back of the bust of Mr. Darcy, which, in the story, was presumably a commissioned work made of carved marble to match the other works in the gallery. The back side gives it away as having origionally been sculpted from clay or plaster rather than carved, with a bust of the sculpture having been cast out of resin mixed with marble dust. The clumps of you see on the back create an unfinished appearance when viewing it from the rear. Busts carved from stone are either smoothed and polished to match the front, chipped down to a reasonably smooth surface of stone, or not shaped at all. Mr. Darcy, flaws and all. 1.) Anachronisms Everywhere – The film was set in 1797, which allowed them to use the lower, Georgian waistlines we see on the Bennets, with Caroline Bingley wearing the “latest” styles from London, which included the Empire Waistline the Regency is known for. There are numerous anachronisms included, some of which are barely noticeable, others which are frustratingly obvious: I knew before I even saw the film that Elizabeth wears Wellington styled boots in several scenes. These were neither available in 1797, nor would they have been considered suitable footwear for a gentle-born woman. The sculpture of the “Veiled Vestal Virgin” in the gallery was not carved until 1847. We see Mr. Bennet cultivating orchids, which was not something a man of his station would have had access to at that point in history. The flag carried by the Militia when they marched into Meryton included St. Patrick’s Cross, which was not added to the Union Jack until 1801. There are a few more, but I think these establish that the film was never intended to be fully authentic to the period, a hypothesis supported by dialogue that is also anachronistic in many places, something that isn’t likely to be noticeable to any but those with an extensive understanding of the language from that era. I confess that I now feel somewhat like Elizabeth’s perception of Mr. Darcy – looking only to find fault. It isn’t my intention to be critical, but merely to share observations and information that fans may be interested in. I started compiling my list with goofs I had personally noticed, a few of which were actually validated by the DVD commentary when I listened to it. I also looked through the “Goofs” section for the film on IMDB and added the Nylon Rope and a few of the Anachronisms listed. There are certainly a few more that were on my list that I didn’t include – feel free to share any other goofs that I missed to this list in the comments. Something I’ve wondered about…..When Elizabeth is talking with her Aunt and Uncle (by the BIG tree and carriage is broken down) she appears to be wearing a brown dress, which shows through her coat. Next, they are at Pemberly and she is in the beige, stripped dress. The scene seems to indicate that they will go to Pemberly when the carriage is fixed, that same day. Diana i never realized about the should have been muddy feet, good note! but definitely noticed errors, ugh using the same props at Pemberly the ones she rans her fingers over her first visit, the same couch, the same huge framed picture above in the 2nd visit but now in different room with pianoforte , I’m thinking “Seriously? ?” , when Bingley & Darcy show up at the Bennets, Elizabeth looks through window to see Darcy turns quickly against the wall and the wall moves!, also at Netherfield the same furniture is used in scene with all Bennet girls except now a bench instead of table, chairs are reused in breakfast scenes and when Darcy was writing at table where now is a bench for Bennet girl scene Jimeny! Spending 8 million really shows in the props, Thank goodness they had Beautiful locations to work with and Beautiful music, it with the Amazing Actors made an Awe-inspiring movie…yet i can’t unsee these wig, prop, building errors now aarrgghh LOL! Oh yes! She had to cut her hair partial way through the filmand so she had to wear avig! How can you tell?! I’ve been trying so hard to spot wig from natural and I simply lack the skill! What is your method? It makes me happy that you had fun reading this list. As for her updo at the Netherfield Ball, I think they probably went to that extreme to show how beautifully she cleans up for an elegant ball. A person with skill at hairdressing can do wonders, so I never thought it was too much. It would be interesting to know if they used a different wig for that scene, or if they styled one of her others. I always felt that the “back of the neck” shots where they show the little fringe that is clipped in a straight edge was a dead giveaway that she’s wearing a wig. There are a few of those. She does have a gorgeous swan neck – can’t fault them for showing it to advantage. In the scene where the Bingleys’ are in the carriage with Darcy heading back to London from the Netherfield house, as we are looking at the brother and sister, through the circle window, we can see the carriage driver’s coat: SUNGLASSES ?! LOLOLOLOLOLOLOLOL Tell me you see it, too! That is one I didn’t spot. Now I’ll have to go back and check. You have a good eye! I’m probably one of the few people who prefers the Elizabeth Grave/David RIntoul version in almost every way. Diana, have you (or anyone else) noticed any goof in that one? I haven’t watched it for ages, so I must have a look-out for goofs myself soon. You must be psychic. The goofs post for the Elizabeth Garvie / David Rintoul will be live in about an hour. I did find some goofs, but had to watch it a few times to pick up on ten of them. Stay tuned for the Trivia Challenge post in four weeks! I find myself studying the ballroom scene in the 1995 film version knowing that a hair over the lens of the camera led to the deleting of much of the dance scenes and it was too expensive to re-film those scenes. It is distracting now that I know that happened. And, while I do like to know of goofs I am sure I will now be looking for those you have informed us about. I know what you mean. In some ways, “ignorance is bliss” and I’m glad that most of the goofs I’ve picked up on are the result of multiple viewings, not something I picked up on in the first viewing. I find it similar to how I feel about the people I love. Since I love them, I embrace all their little imperfections, and even find them endearing. In the end, for me, knowledge of the goofs in a film I really like or love don’t interfere with my feelings about the production. Thanks for your comment, Sheila. My husband bought me this DVD, but I can’t bring myself to watch it. I am too loyal to the BBC tv series, and I detest Kiera Knightly. Ah well. I guess I’ll just watch “Wives and Daughters” again. (It is set in elate Georgian/early Victoria times, but is a delight). Wives and Daughters is an excellent choice – of Elizabeth Gaskell’s works, it ties with North and South for my favorite. 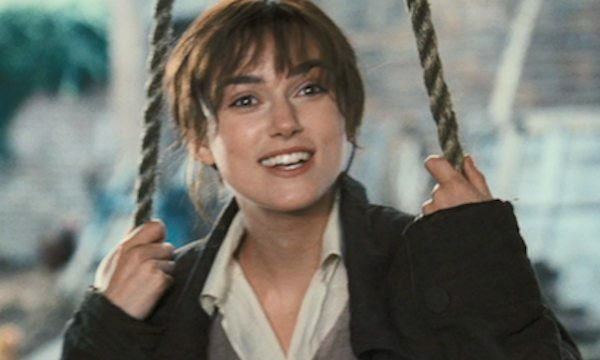 As for the DVD your husband gave you, it is, of course, ultimately your choice as to whether you’ll watch it, but the cinematography is stunning, and I found Keira Knightley’s performance refreshing. She was, at the time, the same age as Elizabeth Bennet is in P&P, so she is naturally a bit less “mature” than Jennifer Ehle’s EB, but I found that it gave me a fresh perspective on the character. I was a skeptic going in, but have decided that both versions have their unique charms. Diana, thank you for sharing these goofs. I’m sure it would be hard to catch them all. Great observations! I never picked up on the goofs. I have always wondered what the deal was with her spinning around on the swing was though… Also what are we supposed to “get” from the scene when she stands on the top of the “precipice” and looks out over the valley in the sunset? I questioned Bingley seeing Jane while she was ill in bed. That seemed inappropriate, although I am definitely not an expert of 1797 etiquette! Also, they used Chatsworth as Pemberley. The owner, the Duke of Devonshire, had an income at that time of about 100,000/year. That makes the house a bit too grand for Pemberley. It’s tough to make a 2 hour movie out of our beloved novel. However, with all nits and goofs, I love the spirit and energy in this version! You’re absolutely right that Bingley just popping into the bedchamber of an unrelated, unmarried lady in nightclothes isn’t kosher in terms of propriety. As for the scale of Pemberley, vs Chatsworth, I hadn’t considered that it was such a stretch – excellent point! The spirit and energy are certainly defining elements of this film. Thanks so much for commenting. I love finding bloopers, goofs and oddities. Yes, I was startled the first time I saw Caroline’s dress. That one slaps you in the face. Lizzy and her bare feet… OMG! For a gently bred women to show the ankle was considered scandalous… so her showing bare feet and ankles… the huzzy. Thanks for this post. I’ve really enjoyed it. Another note… Jane’s hat… was it the same hat used in Northanger Abbey by Miss Tilney? It looked the same? Did anyone notice that? Maybe it just looked like it. I don’t know the answer to your observation on Jane’s hat, but I do know that the costumes in historic adaptations are frequently re-purposed for other adaptations. It wouldn’t be a stretch to think you’re right, or at the least, they used the same pattern. Good eye! I really enjoyed this and I am glad I was not the only one totally confused by the boat, I thought there was something that I had missed or that I just didn’t clue in to from the book. LOL – That boat! I think Joe Wright must be messing with us all with that boat. To be honest, I don’t find that the goofs interfere with my enjoyment too much. At worst, they trigger a moment of irritation, but nothing worse than any scene featuring Lydia. Super yes on Caroline Bingley’s dress! That was the one I noticed most of all while watching actually and it made me a little mad cause they championed the costuming choices (the lower waistlines and the hair among other things), saying that that was how it was when Jane Austen actually first wrote the book and therefore how she imagined it. But then I see Caroline’s bare shoulders… and I feel a bit betrayed hahahaha ? I can follow that line of thinking, but then, when Austen re-worked the manuscript closer to publication, wouldn’t she have re-imagined it to reflect the new cultural reality? As for Caroline’s bare shoulders, there is no excuse, really. We know that the director overruled what their historical experts said when it came to Elizabeth and bonnets. He may have wanted to make Caroline’s fashion choices seem daring and sophisticated compared to the country bumpkins they were surrounded by. In this case, it was a fail – but I imagine a large portion of the viewership didn’t even realize it. I enjoyed this post a lot Diana. I remember being so disappointed after seeing this film version the first time. Probably because I had such high hopes. After thinking about it a short while, though, I came to believe the film makers were trying to appeal to a much younger, modern, and non-Austen savvy audience. A group of viewers who may have seen the 1995 version but thought it was too long (God forbid) and never bothered to research anything they didn’t understand of the language or customs. I then cut it some slack and went on to re-watch and enjoy it very much. 1995 still my favorite, though. However many things in that movie I just had to accept and move on with, Caroline’s dress still makes me want to throw something violently at the screen. The first time I was nearly sick to my stomach. Gawd. She looks like she’s wearing a shift. I have to say that my hubby is very supportive of my Jane obsession and took me to that movie when it first came out. What irritated HIM the first viewing through was Mrs. Bennet scolding Lizzy from the bottom of the staircase, (and forgive me I haven’t seen this one in a bit so I have to just give you the gist,) ‘Just wait till you have five daughters to marry off, young lady.’ He said, in the theater no less, ‘Did she say that in the book?’ Still makes me laugh. I prefer to imagine her Wellies, or half-boots, or whatever, back out of sight, because she’s kicked them off to enjoy the freedom. 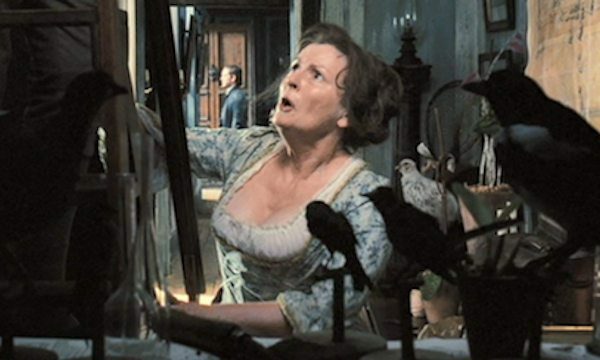 I’d be scolding her like Mrs. Bennet though. Not a safe place to go barefoot for even a little while. Michelle, I think you’ve just voiced the experience of many of the fans of the 1995 mini-series the first time they watched it. One of the things that has helped me embrace some of the oddities is the thought that there are always outliers when it comes to cultural norms, so things that fall outside of the expected behavior don’t have to necessarily be wrong so much as unusual. For example, I’m fairly certain that there were ladies who showed up to a dance sans gloves now and then – they were lost, forgotten, damaged, etc. It just doesn’t seem what I would expect of Elizabeth, since both she and Jane were acknowledged to comport very well in society. Caroline, as the hostess of the ball for her brother, wouldn’t wear a gown that would be shocking in a way that would damage their reputations. As for the bare feet, I did look for some evidence that they were close enough that she could reach them from the swing, but saw nothing. And how did she twist the ropes without putting her feet down? UGH. I need to stop thinking about it. LOL. I only knew two of the goofs you have found after 50+ viewings… The moving sun in the opening scene and Mr Collins lurking in the background. Still love it though. There is a great shot of the Bennet sisters all lined up on the balcony in their ball gowns and you see that Elizabeth is the only one without gloves, so the costumers were certainly aware that gloves were expected. If you watch the other ladies in the scene, there are one or two others without gloves, but the vast majority are wearing them. I look forward to reading your post, Gianna. I’ll watch for it! I agree on the gloves. It’s sort of along the same lines as the part of the no bonnet, Wellington boots directorial choices. As for the hair, it bothered me a bit at first, but I eventually realized that the “always up” fashion was less established in 1797 than it was during the actual Regency. It was certainly a directorial choice – I think her hair looks almost like she just got out of bed there. LOL. This interpretation of Elizabeth is very earthy and almost tomboyish in many ways, definitely not a follower of the rules, or much interested in fashion. Thank you for the wonderful insight to the goofs. I think most of us are so enthroned with the plot, actors and Jane Austen’s beloved story that we don’t see what is in from of sus. I could imagine Mr. Collins snooping in the background so that one wouldn’t surprise me in the least. Once again, thanks for the great “goofs: article. Thank you, MaryAnn. I’m glad you enjoyed the post. I am glad I am not as fastidious as you Diana! 🙂 Just channeling Charles Bingley! I could never enjoy the movie if I noticed all these things and I love to get lost in the story and not think of all the mistakes. Even when I know it is not in the original P&P, I love the wet shirt scene from the 1995 version and the kiss at the end of the 2005 movie. Call me a romantic! What a fun list! Some obvious and some not so. Still, I love all the versions that are out there and hope there will be yet another take. Thanks for your post. PS, I think the clean feet on the swing is my favorite! Yes! I’d like to know how she pulled it off! I am so glad you made another list for the 2005 movie and hope you might continue with more Jane Austen adaptations. I enjoy learning about all the “goofs” others find as I never seem to notice anything. The only one I caught was that her feet were not muddy on the swing. The boat I don’t remember seeing at all definitely will need to re-watch and look out for that scene. We’ll see. I won’t make any promises, but I’ll think about it. I have an idea for a series of posts that has caught my imagination at the moment, so if I do some others, they’ll be down the road a bit. I appreciate the feedback of knowing that you enjoy this type of post though. We aim to please! Elizabeth nevers wears a bonnet (so wrong for the times), except in church. Apparently, this was so audiences could pick her out easily in a scene. They didn’t want her to wear a bonnet in church but the historical advisor put her foot down and insisted. There was no way a woman would go to Church without something on her head at that time. It’s true. They had Elizabeth flaunt the feminine norms quite a bit, and is without a bonnet almost all the time, even when her sisters are wearing them. She still somehow manages to maintain a porcelain complexion in spite of being in the sun so much. Well it’s obviously no use expecting further goofs from me as I didn’t spot any of those. However as I am possibly one of the least observant people ever that is no surprise. In fact even after reading this I probably still won’t notice them but thank you for sharing.